Casement windows are one of the most popular window options available. This is because they look great in almost any room of your home and offer many benefits that you won’t get with other window styles. The most obvious benefit is that casement windows are operated with the use of a hand crank. This gives you the ability over how much your windows are open – you’ll have complete control over the air flow in your home. Many homeowners fear that their clothes or bags will get caught in the hand crank because it extrudes from the frame. Feldco has you covered with our hand crank that folds into the frame. This allows it to lay flush, preventing snags. Being able to control how much your window opens doesn’t just effect air flow. It also makes it much easier to clean your casement windows. As the casement window opens, the back end moves closer to the window. As the window moves closer to the middle, it makes it easier for you to reach both ends from the inside of your home. Whether your window is on the first floor or the top floor, you’ll be able to easily clean both sides of your casement window. 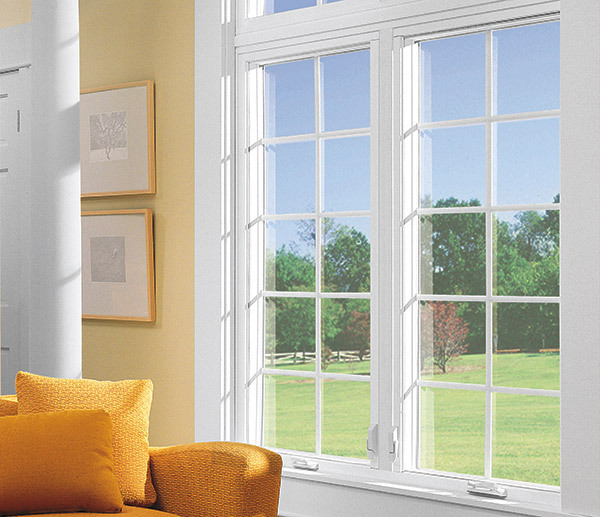 Feldco windows are built with Madison weather in mind. That means they need to be energy efficient so your home doesn’t suffer from the erratic weather changes. With double pane, argon gas-filled glass and foam insulated frames, you’ll be able to maintain a comfortable temperature in your home year round. Not only will you have a comfortable home but you’ll save money on your energy bills. By keeping drafts out of your home, your furnace and air conditioner won’t use as much power to reach your desired temperature, lowing your bills. A casement window won’t be able to fulfill its purpose without proper installation. You can rest assured when you choose Feldco for your casement window replacement because the installers are factory trained and certified. Get a free quote from Feldco and get started on your replacement window project today.